The best place to start exploring Australia's oldest city is at The Rocks, a restored 19th-century village at the southern end of the Sydney Harbour Bridge, which was the site of Australia's first European settlement in 1788, and is therefore considered to be the birthplace of the nation of Australia. The area features cobbled streets and squares, gas lamps, craft shops and small restaurants. 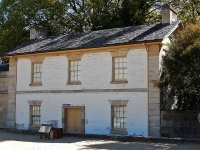 Here too are several historic buildings, including one of the city's oldest, Cadman's Cottage, built in 1816, and two of Sydney's oldest pubs, the Lord Nelson and the Hero of Waterloo. It is recommended that visitors seek information and a map from The Rocks Visitor's Centre (in George Street) in order to make the most of the neighbourhood and its many attractions, which include museums, viewing sites, markets, monuments and buildings. From The Rocks it is also possible to access the Pylon Lookout on the famous Sydney Harbour Bridge for an amazing view of the harbour and beyond.